Around 1947 innovative car enthusiast Jesse Lopez dreams up his ultimate Custom. Together with Sam Barris he creates what would become a true Custom Car Icon. 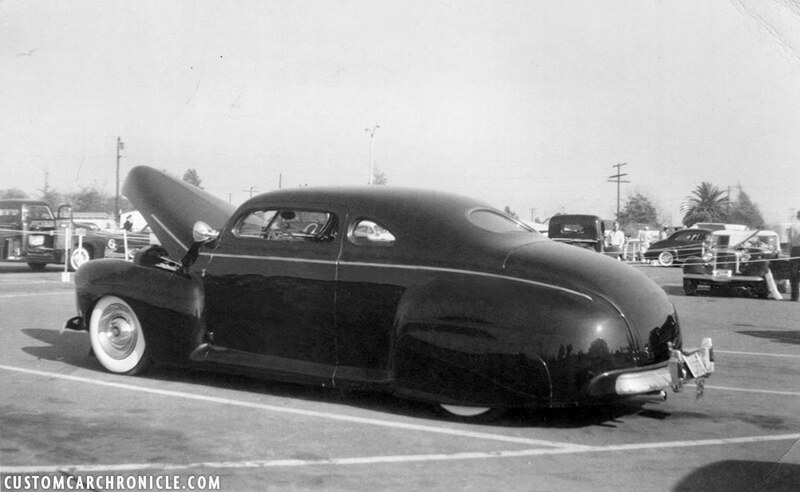 The Jesse Lopez 1941 Ford. The subtitle of this article “The Ultimate Taildragger”, might not be totally period correct. 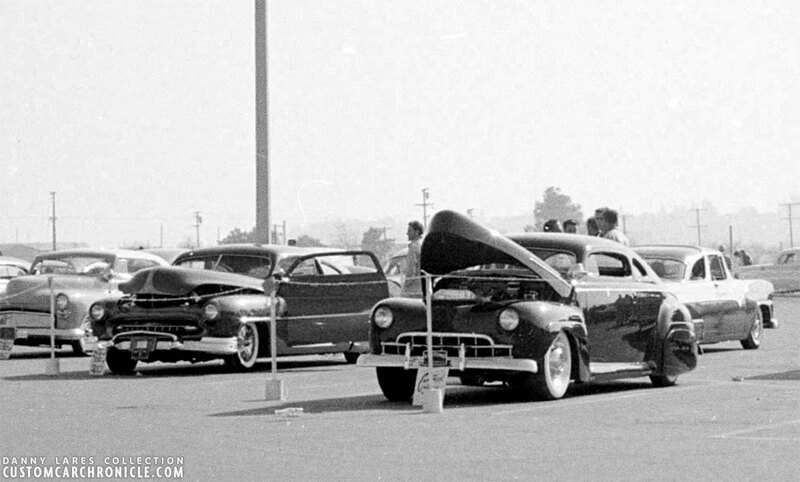 The word Taildragger given to a pre-1948 based Custom Car with the rear suspension significantly lower than the front, giving it an emerging from the water speed-boat stance was born much later than when the Jesse Lopez Ford was originally build. 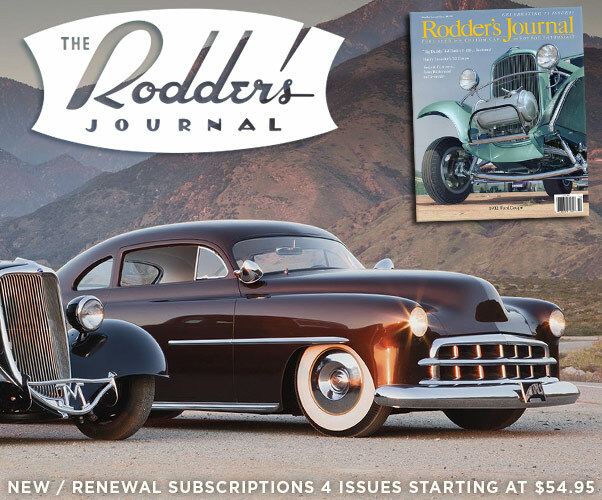 Still I like to use the “Ultimate Taildragger” title to describe the Jesse Lopez ’41 Ford Coupe since the car can be seen as one of the most distinctive and earliest Custom Cars of its kind. The one that surely set the style. And today if somebody talks about a Taildragger Custom, it is the Jesse Lopez ’41 Ford that comes to mind at first… most of the times. 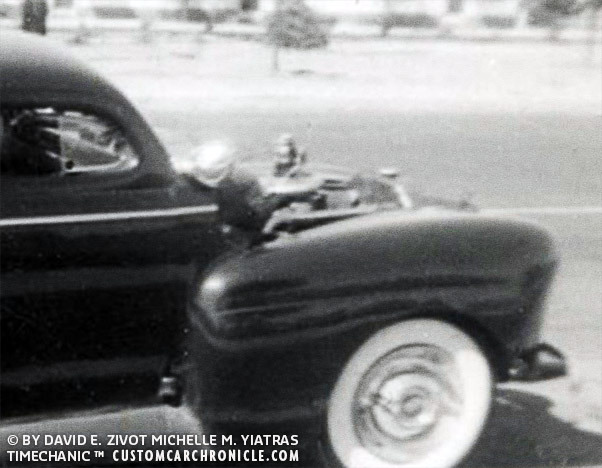 We have already shared the amazing two part article on Jesse Lopez written by Michelle M. Yiatras here on the Custom Car Chronicle, that concentrated on the life of Jesse Lopez on the 1940’s and 1950’s. It included some stories on Jesse’s ’41 Ford. But now it is time to get up close to Jesse’s Personal trend setting Iconic ’41 Ford Custom, and share the car in all its beauty. Before buying his ’41 Ford coupe Jesse had owned two Hot Rods, an A’ RPU with the pick up box removed, nicknamed “bucket”. A very fast rod. The other was an was an AV8 roadster and, the third car was a little more of the Custom kinds a ’36 2 door-sedan. Jesse was more a Hot Rod than a Custom Car guy, but he still wanted to have a full custom, just as some of his friends had. They were just more comfortable and great for picking up girls. 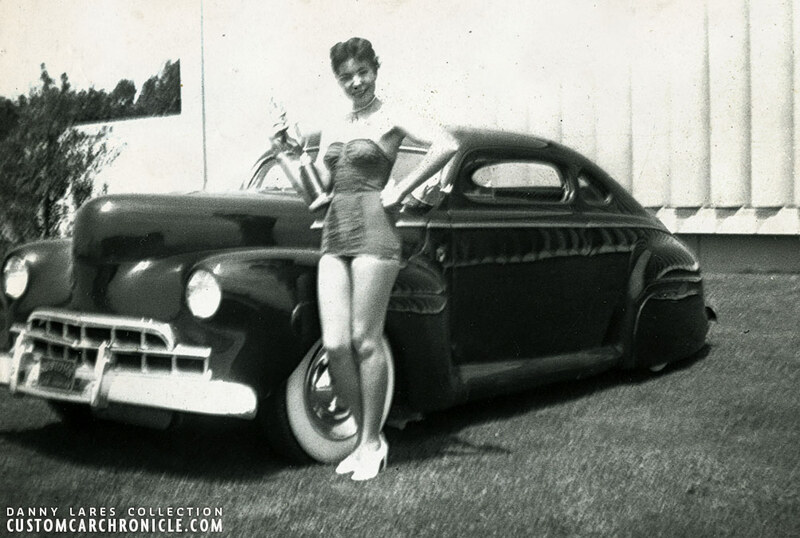 At the time a lot of the Custom Cars were based on convertible and had beautiful styled padded tops. Jesse really liked the shape on the padded tops, but for his personal ride he wanted to have a coupe. 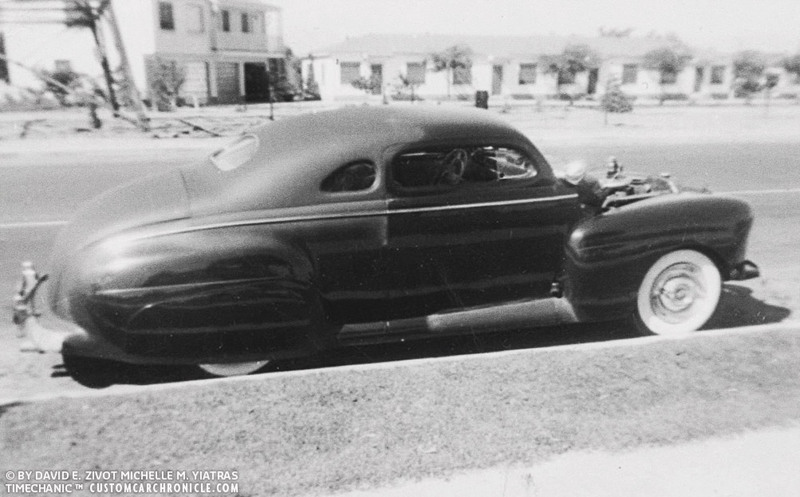 This is the oldest photo we have been able to find of the Jesse Lopez ’41 Ford. Completed, but still in primer wearing the Single Bar Flipper Hubcaps. Jesse discussed his ideas he had for an ’41 Ford Custom with Sam Barris at the Barris Custom Shop on Compton Ave. Sam suggested Jesse should get a short door coupe, since those would create a much sleeker custom. Plus Sam had already chopped on of those short door coupes recently, (most likely the Snooky Janich ’41 Business Coupe, or perhaps Bill DeCarr’s ’41 Mercury, both short door coupes done very early at the Barris Shop.) so he knew how to tackle that for the best result, plus he thought the long door coupe would need much more work to look right. Jesse was not quite sure about the short door coupe’s lines, and really wanted to have a back seat for his ride. So he found a picture of an long door coupe and started to cut the top of the car on the photo with a pair of scissors and pasted it in place to where the car had the profile he had in his mind. He loved it, and the longer doors worked really well with his design. He showed his taped together photo collage to Sam and told him this is what I want. Sam agreed and Jesse went on to look for the perfect base car, he found a very cherry ’41 Ford long door coupe. Work could start around 1947, Jesse was in his senior year of High-school, and Sam and Jesse made a deal for working on the car. As in most cases at the Barris Shop the customer was allowed to work on the cars themselves as well, under supervision of the Barris crew. This was to help save some money, and to speed up the process. Jesse was a very handy guy so he could help a lot on the car. It was Sam Barris who did the initial body work, and Jesse worked from there. Jesse mentioned that only Sam Barris worked on the car, “George never touched it“. The car was lowered with a dropped front axle, and the rear of the frame was kicked up (channeled) to get it as low as Jesse wanted it. He ran stock springs an no shackles. The car drove very good, it was low and especially if he had passengers (car had a back seat) the car would hit the ground when they ran over a bump in the road. He later installed rubber stoppers at the low point of the frame. It still bumped, but it did not sound all wrong anymore. Freshly painted photographed at the Barris Compton Ave shop. 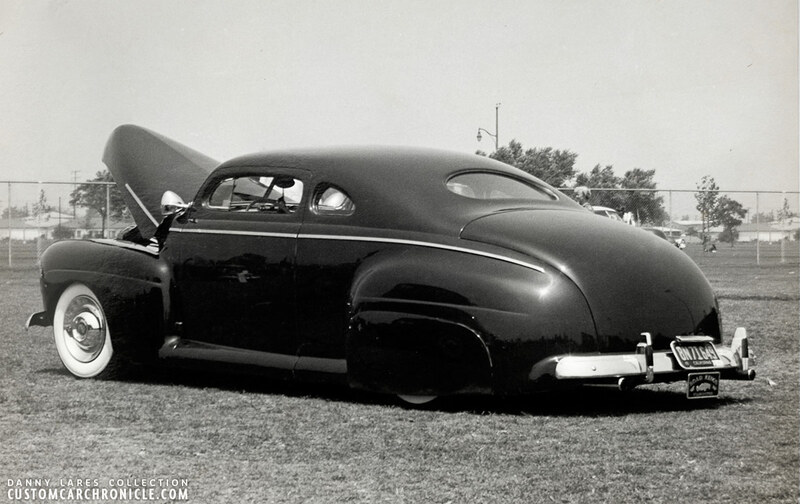 Amazing flowing lines make the car look ultra modern in 1948. Notice how low the car is showing just a small portion of the rear white wall tires. No matter what angle you look at Jesse’s Ford, the chopped top, as well as the rest of the car looks absolutely stunning. The next part to tackle was the chopped top. Jesse’s cut and pasted photo showed a very low profile, with a heavy chop. How much was cut from the pillars we don’t know exactly. Measurements published in the past and present vary from 4.5 to 6.5 inches, and also an 8 inch tall windshield has been mentioned. Whatever the amount of material was that they removed, it turned out to be just perfect for Jesse’s Coupe. 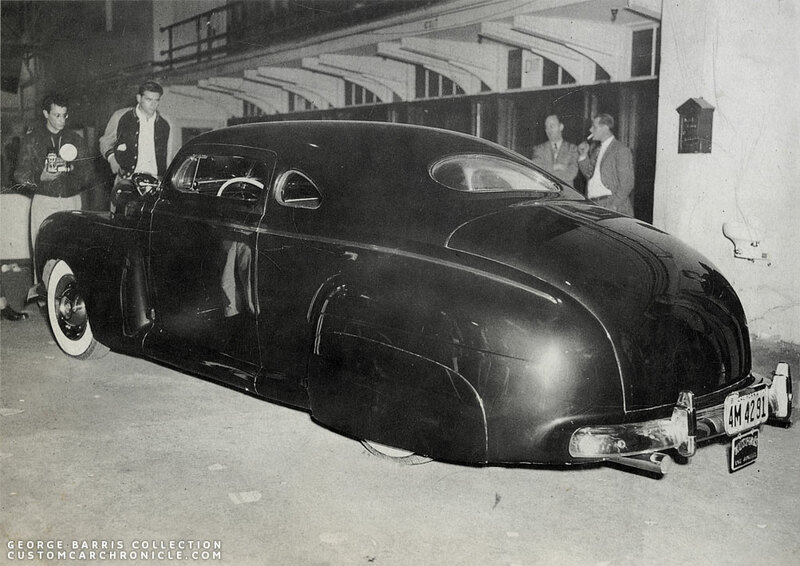 Jesse wanted to have the rear of the roof to be shaped inspired by the Padded Tops he saw on most of the custom cars. They cut the top off going through rear window opening. They removed the B pillars and put them aside. Bumper jacks were used to spread the A pillars. After the windshield height was where Jesse wanted it, it was tacked in place. The top was allowed to settle until Jesse saw that Padded top shape. The B pillars were cut to fit and tacked in place. The top was going to have a slight hump at the back, which would later become a Barris trademark. Jesse remembered that getting everything to work together was a real sonofabitch. At one point he decided to mock up the complete rear of the top in heavy chicken wire covered with masking paper and adding some primer to blend it in with the rest of the body. Then Jesse and Sam would stand back and checked to see if it looked right from all angles. Several tries were needed before Jesse was perfectly happy with it. At that time Sam had already lost his patience and let Jesse do the work on the mock up. 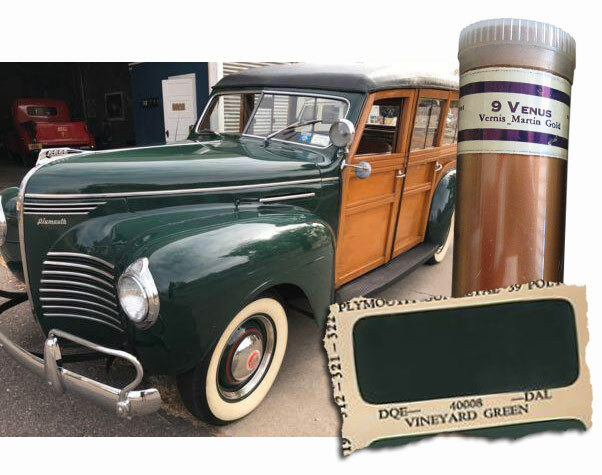 Jesse and Sam created a custom color for Jesse’s ’41 Ford based on a 1939 Plymouth green color (Vineyard Green). Toners where used to make it darker and deeper. Venus Martin number 9 gold powder was added for some extra sparkle. 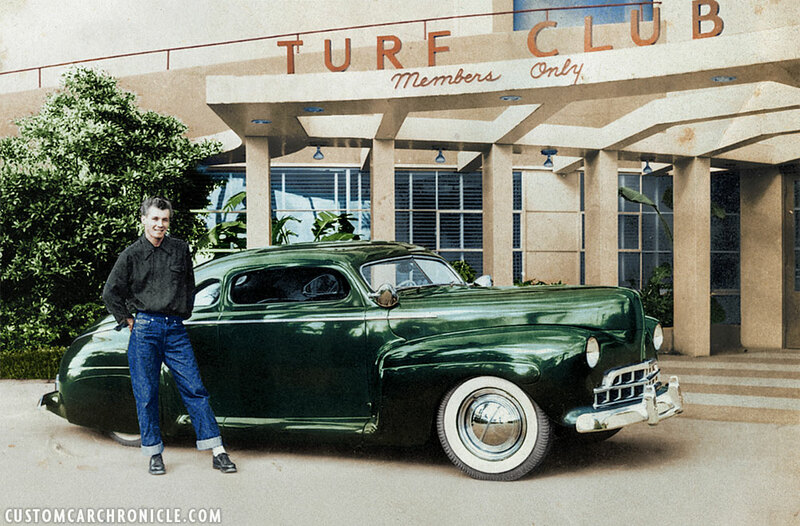 So far no actual color photos of Jesse’s Ford have surfaced, so This colorized black and white photo is the best alternative to give an impression how stunning the car must have looked in the late 1940’s. Now the shape needed to be repeated in metal, and that is were Sam Barris’s skills were needed. Sam shaped the ’41 Ford top till perfection and according Jesse’s mock up. The rear of the top metal was cut right across the rear window, the shape Jesse wanted dictated that the cuts needed to be made right there. They would worry about the rear window at a later point. Sam and Jesse hammer and dollied the crease out of the lower panel, below the rear window glass, and tipped the metal forward to meet with the top of the roof. Jesse used pieces of hacksaw blades with home made handles to cut slices in the lower top area and the upper rear body panel area. These two areas came together and the overlapping metal was removed. This resulted in the rear window being chopped a bit. The pie shapes that were open after reshaping the top using the slices sections were filled with metal pieces and everything was welded up solid. Jesse mentioned that the smaller than stock back window was composed of a sheet of 1/4″ aircraft grade Plexiglas, that he got to bend and conform to the convex ellipse, because of complications cutting tempered glass. 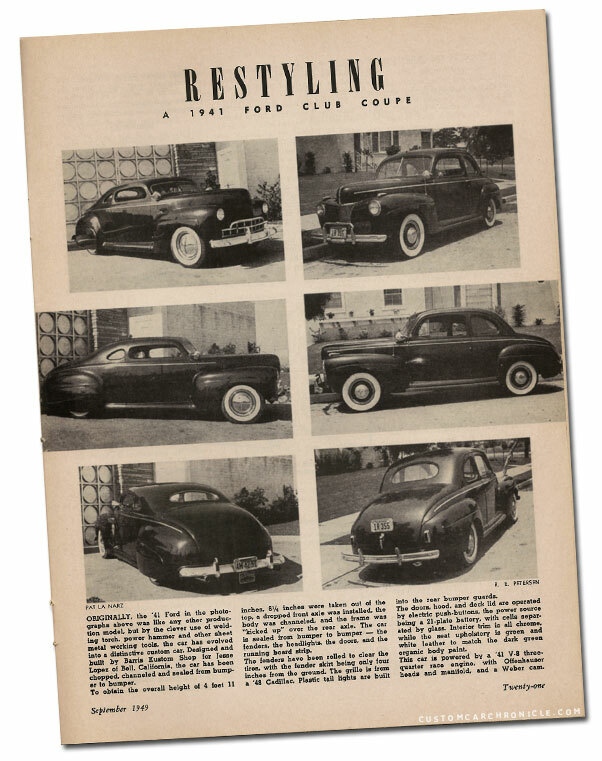 The September 1949 issue of Motor Trend had a one page article on Jesse’s ’41 Ford, comparing it with photos of a stock Ford made the reader realize how much more beautiful the Custom Restyled version of Jesse is. The rear quarter windows were up next, and those turned out to be just as difficult to do than the top. When the top was chopped they had removed the drip rails and the door rear corners (sharp from the factory) looked odd, and did not blend well with any shape of the rear quarter windows. So the rear door corners were reshaped and rounded to flow with the shape of the top. At one point he completely filled in the quarter windows to figure out the best shape of the rear quarter windows. A lot of cutting, pie-cutting and welding was needed to get the frames in just the right flowing shape to follow the door windows, as well as the new roof lines. Remember that during the time this car was built it was Jesse’s only driver. So even during the chop process Jesse drove the car, without the top, the top partly chopped and sitting on nothing more than a wooden crate… wild! When the new top finally had the perfect shape everything was hammer welded and leaded to get it perfectly smooth. Next up was sealing in the fenders. (later this would be called molding the fenders) hand shaped metal shapes were welded from the fenders to the body to give them a perfect radius and the desired one piece look. The running boards were removed, and the lower body panels were extended down with rolled metal to cover where the running boards used to be. All handles and emblems were removed and the holes filled. The two part hood was welded solid and a subtle peak added in the center. The two part front fenders were also welded together for a smoother look, and the fender crease that used to run all the way to the front of the car was reshaped just in front of the wheel opening, very much like a ’46-48 Ford fender, but with a touch of Jesse’s own styling. 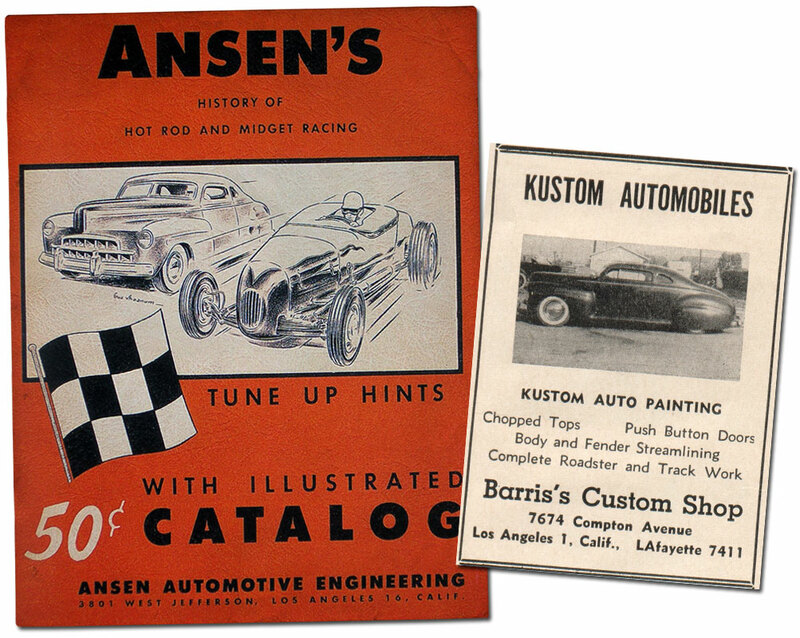 The Ansen’s catalog shows Jesse’s Jesse’s Ford in an illustration drag racing on the cover… this really happened. 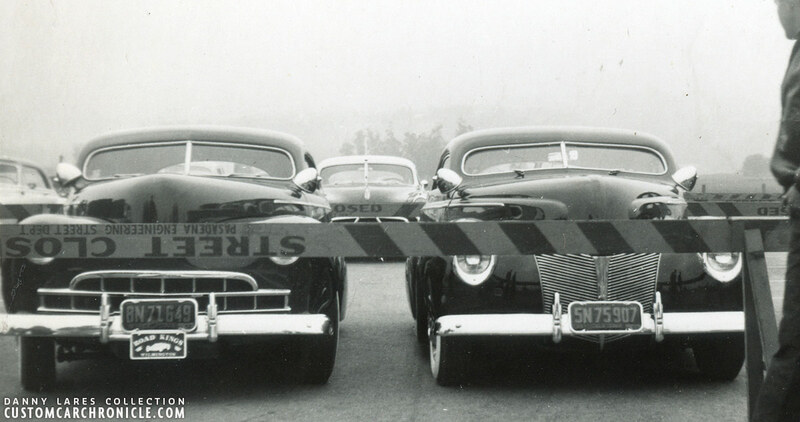 On the right is Jesse’s Ford used in a late 1940’s Barris Hot Rod magazine ad. 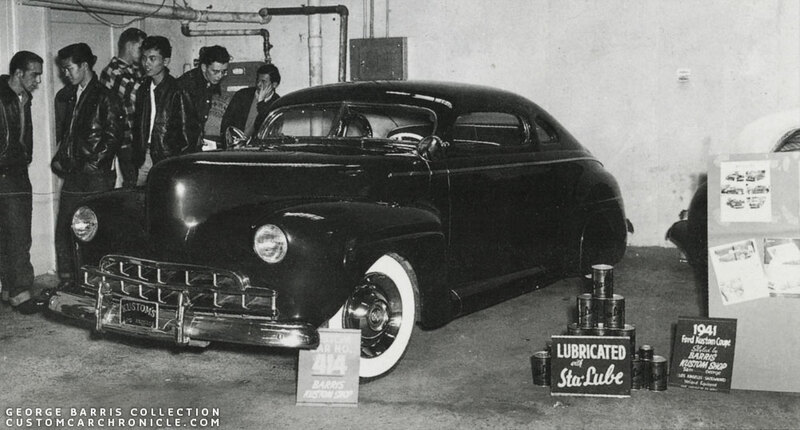 The first version of Jesse’s ’41 Ford was also published in the Trend Book #101 Custom Cars published in 1951. Here it was mentioned the car was chopped 6/5 inches, but also that the car was channeled. 3 more photos of Jesse’s Ford were used thru-out the booklet. 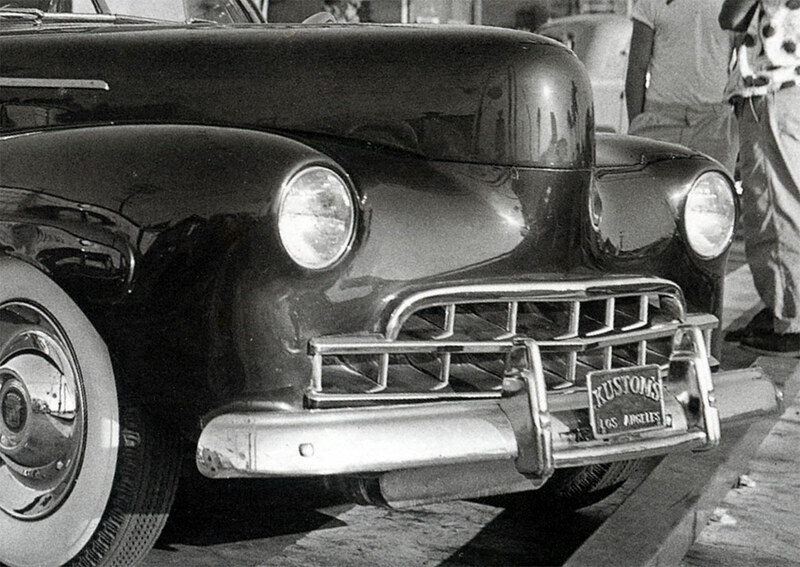 For a custom grille on his ’41 Ford, Jesse wanted to use one of the not even available ’48 Cadillac grilles. He had seen the new ’48 Cadillac’s in an advertisement or something like that. And he knew that that grille would be perfect for his car. 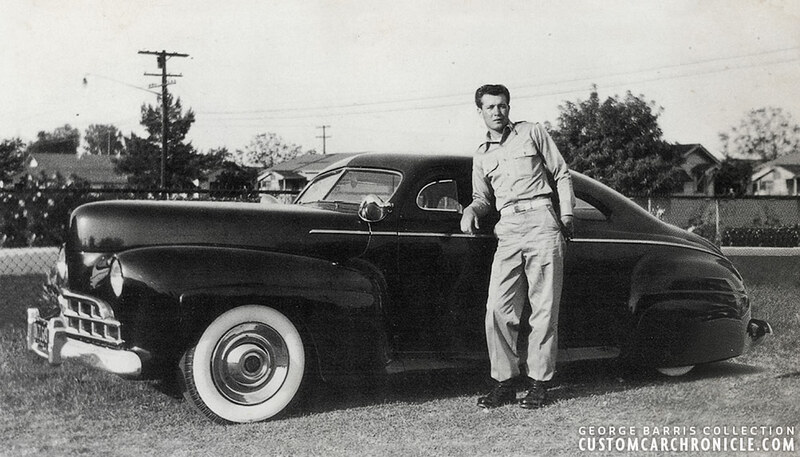 He wrote a letter to Cadillac and told him about his plans for the grille and asked if he could get one for his ’41 Ford Custom being built at Barris. He mentioned his good friend’s father owned a local Cadillac dealer ship. Some time after that he gets notification that there was a package from Cadillac at his friends father Cadillac dealer. It was the new ’48 Cadillac grille, he got one from free.. no charge. The grille was perfect. Sam and Jesse worked hard to get the grille to work with the ’41 Ford body lines. They decided that the lower section of vertical grille bars needed to be removed. The placing of the grille on the stock position of the front splash pan turned out to be to low. To get that grille in the correct relationship to the hood and headlights, they lifted/tilted the stock bumper brackets up. This raises the gravel shield around 2 inches higher than stock. The grille sits 1/4 inch above the gravel shield to make it look more factory, this all created the perfect location for the Cadillac Grille. Sam and Jesse used an aftermarket, blank center grille, replacement panel cut down to fit with the Cadillac grille, and molded it in place. There is only one snapshot showing Jesse’s Ford with the Blower set up and removed hood. The way he drove it at the drag races. The rear of the car is in primer in this photo, some small body work was done before another paint job was added. With all the work done on the car it was sprayed with several coats of dark gray primer. This is how Jesse drove it around for a while. The car had wide white wall tires, single bar flipper hubcaps and beauty rings, and a set of wired and working Appleton Spotlights installed. Even in primer Jesse’s car looked stunning. The car remained in primer all the time he was at basic training because he was driving it back and forth routinely from LA to Fort Roberts. 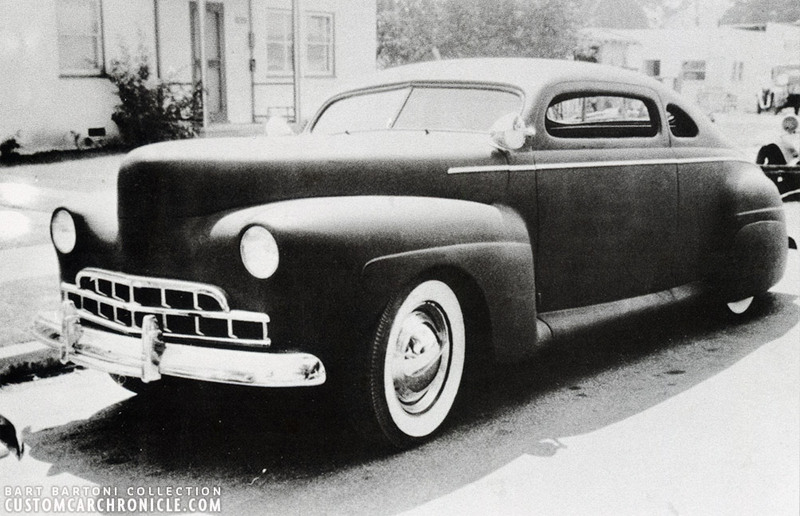 When it came to choose a color for the Ford, Jesse did not want to use what “everybody” else was doing, dark maroon based on GM-Buick colors. Jesse really wanted a light color for the car, his personal favorite was a pale yellow, which would have made the car really stand out between all those dark color painted customs. But in the end he decided to go dark anyway, dark green. Some of Jesse’s friends in booth camp posing with the ’41 Ford. All the guys loved that car. 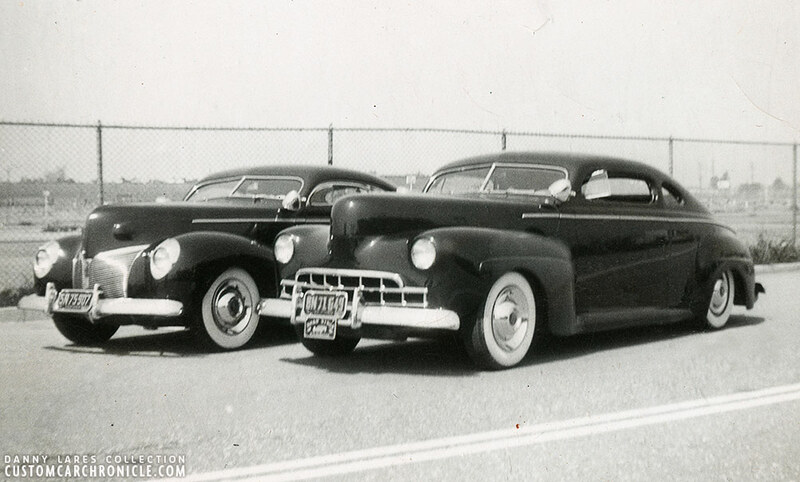 In 1949 Jesse replaced the Single Bar Flipper hubcaps with Cadillac Sombrero units. 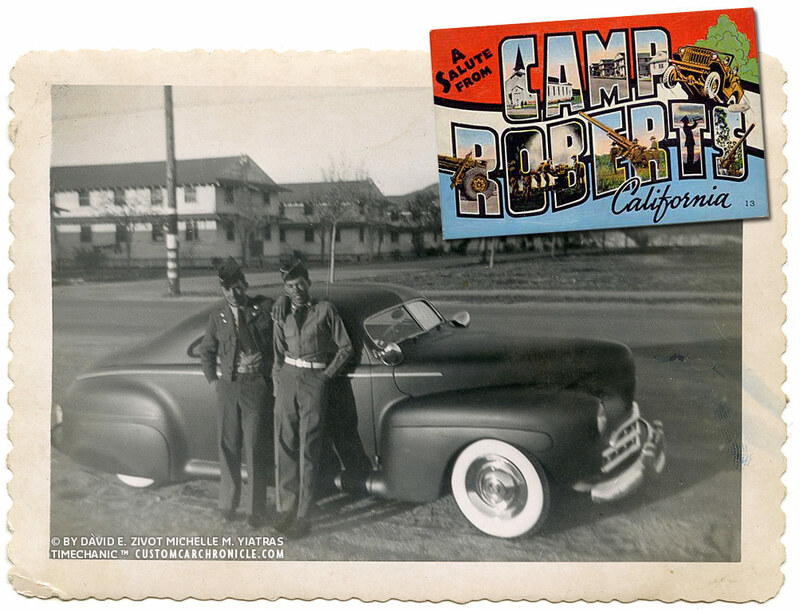 This snapshot taken at Camp Roberts really shows the beautiful shape of the top and rear quarter windows. The first color used on the 41 Ford is a custom mix, but it is based on a 1939 Plymouth green color (Vineyard Green) nitro lacquer. Toners where used to make it darker and deeper. Venus Martin number 9 gold powder was also added. They used a motorcycle tank for test shots of the paint. The tank’s curvatures shows how the paint would look on the car. All the paint that was mixed was used on the car, and no extra paint was made for possible future touch ups. They figured if they scratch the paint, or worse, it was easier to repaint the whole car…. in a different color. The first paint-job was sprayed by Sam Barris. Over the relatively short time Jesse owned the car it was repainted a few times. Always in shades of dark, or darker greens. A later color was based on ’47 Chrysler Adante green Rinshed-Mason again with with fine metallic gold Venus Martin powder highlights, M & H in LA mixed the paint. The car was complete built at the Compton Avenue Barris Shop. The shop was basically a two car garage, but longer. But most of the time the work on the car was performed outside, the weather was always good. 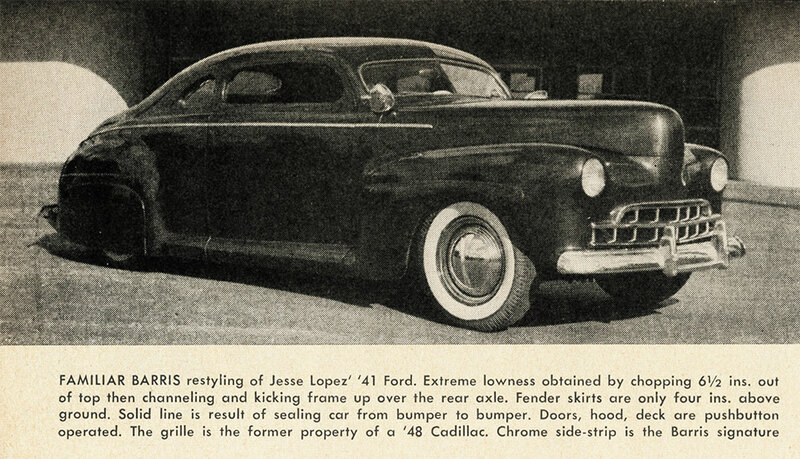 Some small, but very nice photos of Jesse’s Ford appeared in the October 1951 issue of Popular Science. Among the photos used is a nice photo showing Jesse using the “hidden” button the the rocker panels used to activate the door opener. 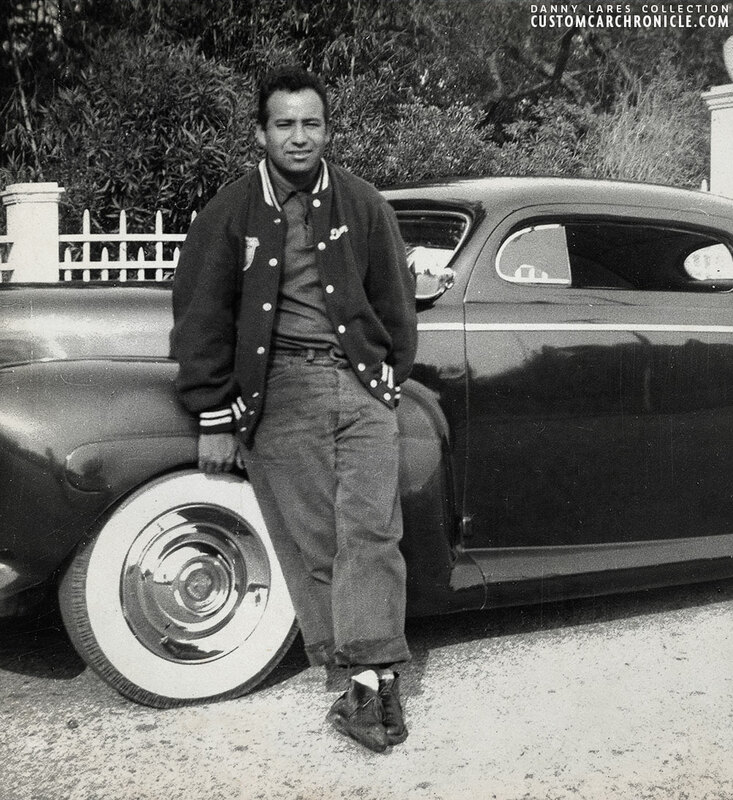 Jesse lopez posing with his 1941 Ford in 1949. 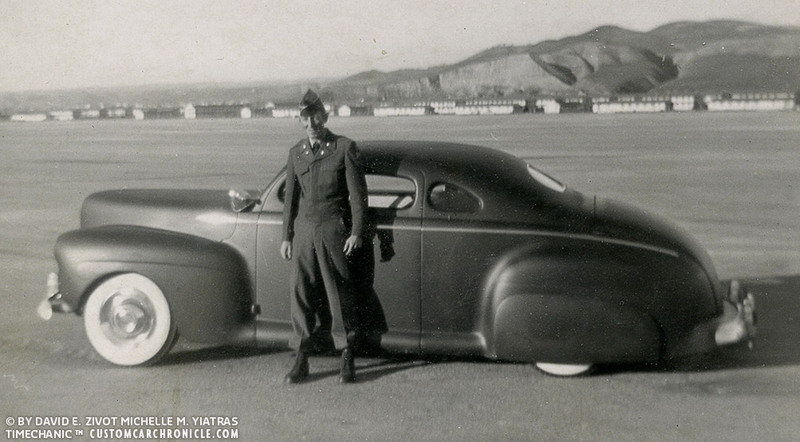 Jesse Lopez entered his ’41 Ford in several car shows over the time he owned the car. He also drove it all the way to Oakland to enter the car in the first annual Roadster Show. One of the shows that would turn out to be very Custom Car orientated. Jesse’s Ford was a huge success at the show with a crowd around it all weekend long. Jesse’s 1941 Ford at the 1950 Oakland Roadster Show. 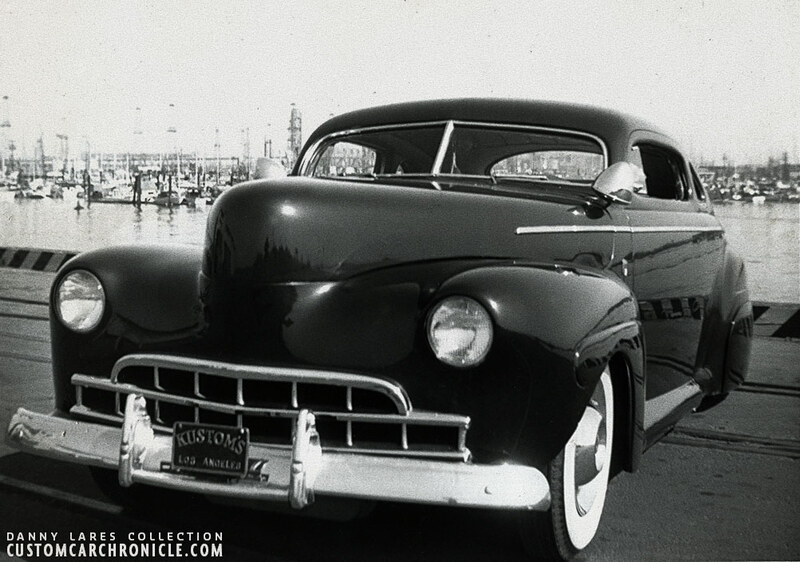 Jesse was a proud member of the Kustoms Los Angeles, and he ran KLA brass plaques both front and rear. This photo was taken during set-up day. 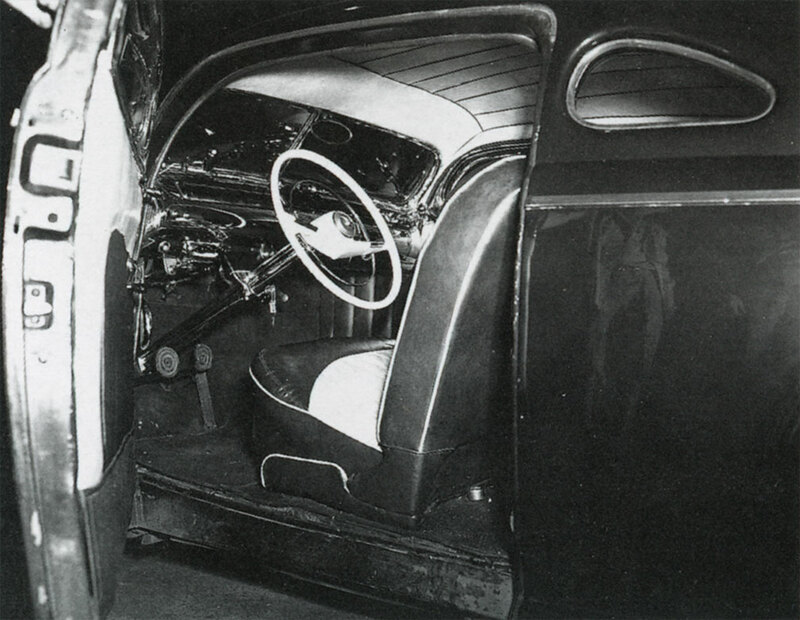 The interior of Jesse’s Ford was done by Carson Top Shop, and according to Jesse it was done a bit crude. It had 1.5 inch or perhaps wider pleats done in white and green. Jesse smoothed the dash and had it completely chrome plated. He had followed a class how to work with Lucite, when the product was introduced. There he had learned how to shape and glued the material, and during the build of his Ford he realized the material would be perfect for use on his – and later other – Custom Cars. To cut the material they used to drill holes close to each other and cut it apart with a hand saw. Then files and sand paper where used to smooth everything and finally it was polished. Jesse had removed the stock plastic dash panels and hand shaped new units in transparent green Lucite. He also replaced all the factory dash and shifter knobs with hand made units created from green Lucite. This made the interior of Jesse’s Ford look very modern and totally unique. 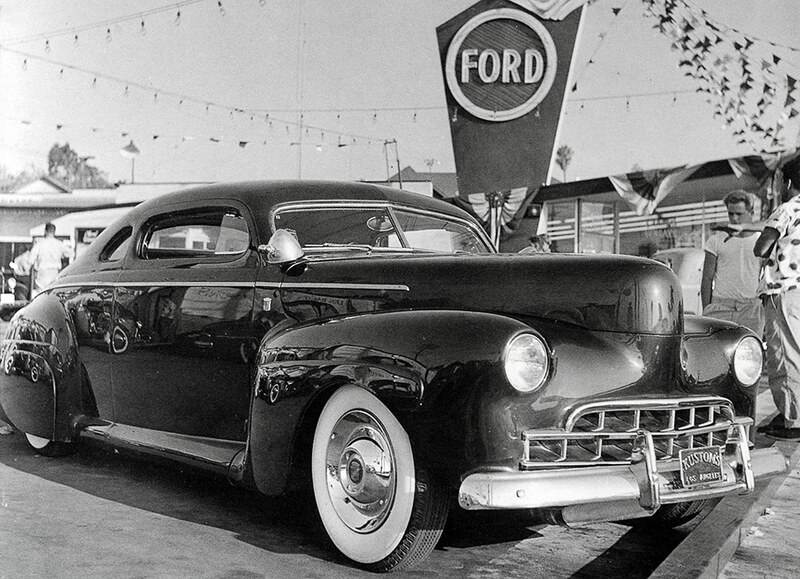 The new ultra smooth body lines looks fantastic on Jesse’s Ford and it was a big hit in 1948. Everywhere he went it was a crowd pleaser. When he went for a burger, or whatever, there was always a crowd around the car. 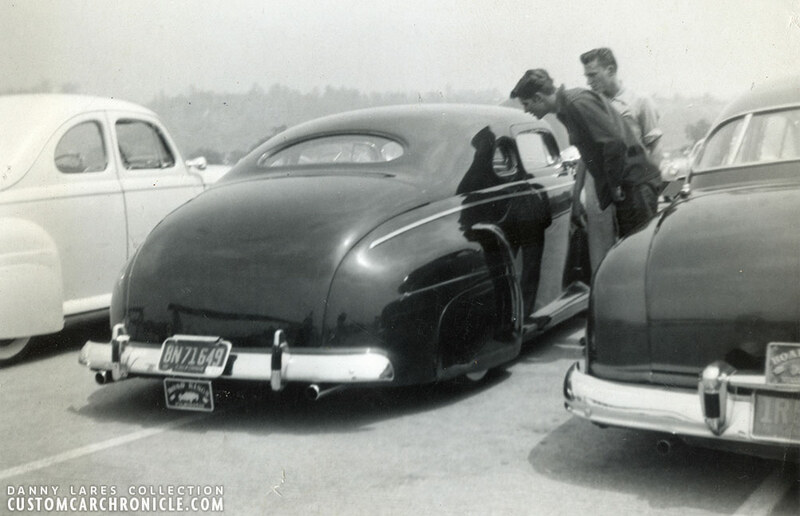 Jesse’s ’41 Ford was a trend setting Custom that had a lot of first in the field going on. It was as far as we know the first long door coupe that got chopped, had the first bumper guard taillights of this kind, had the first rolled over running boards, and Lucite elements in the interior. Jesse’s Ford parked next to Joe Urritta’s Barris built 1941 Ford convertible at the show. Jesse whad his ’41 Ford at the first Oakland Roadster Show in 1950. In the top photo Jesse is standing with Miss CA. holding the trophy he just won with the car. Jesse was really into driving fast so the stock engine was replaced by an a 3/8 by 3/8 stroker 59A. Under the hood, it was all business. No polished/chromed anything. During the week he had two Stromberg 97’s on a Edelbrock low boy intake and Edelbrock heads. The heads were also Edelbrock, with headers. The headers had bungs in them so that he could open them at the races. Jesse also created a set up with a McCullough blower that he used on the car for drag racing. The car was too heavy and low to race, but he wanted to race it so he put the charger on it, and ran it without the hood. Lincoln Zephyr gears in the transmission with the blower. They all used Lincoln gear boxes back then. Jesse also had to have a special made big radiator because it ran so hot, 4” core and 4” tank. One carburetor off a Buick Roadmaster with a large venturi to let more air in, Fritz figured that out. He built the motors for most of the LA guys back then. The Appleton 112’s were wired and worked, the spot handles were green Lucite to match the Lucite on the Chrome plated dash. The doors kicked open by buttons hidden under the rocker. Notice the used look of the frame covers, that is because the car was Jesse’s daily driver. Shortly before the Oakland show Jesse replaced the stock steering wheel with a Mercury Monteray Steering wheel. Close up of the bumper guard taillights Jesse created for his ’41 Ford. Notice how the Lucite was not only used on the most extended shape of the Art-Deco shaped guard, but also on the side pieces with the tops nicely rounded. This is how several of the early bumper guard taillights were done. This photo also shows the light fixture Jesse created above the license plate. When Jesse got drafted he still would drive the car to boot-camp. But after a while he gave the car to his brother Memo. But his brother was not such a good driver, he was not really into cars and found the chopped windows to small to drive safely. So he asked George Barris to find a buyer for the car. Jesse was send overseas to Korea and Japan and Danny Lares showed interest in the car and ended up buying it. 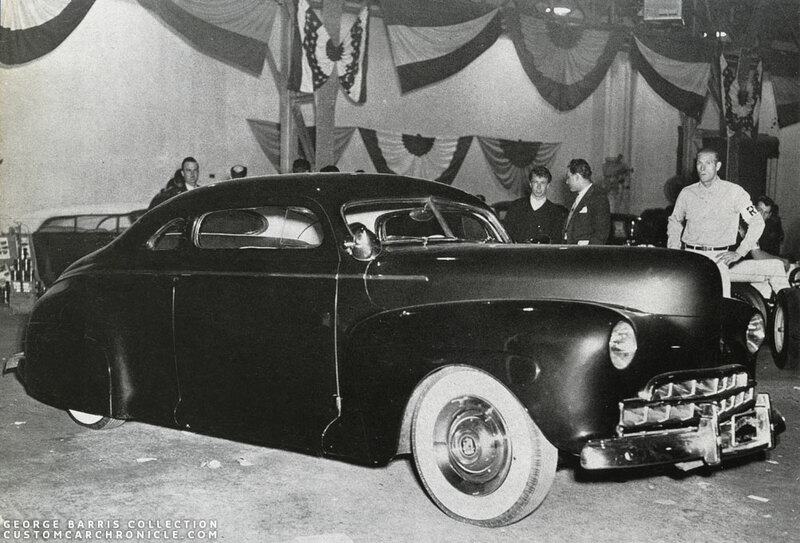 The 1941 Ford was Jesse’s only real custom car. He later owned a 1951 Cadillac that he rebuild as a 1952, with really nice paint as a mild custom, a 1956 Ford Pick-up mildly restyled with his own mix of Candy Red Paint. And a brand new 1958 Ford Thunderbird that he took right of the dealer’s lot to the Barris Shop for a new paint-job in Candy Red Paint mixed from his own formula. George Barris was so impressed with this paint that he bought the confidential mix. But that was it. Jesse was to busy with customer cars to do cars for him-self. Jesse now owns a 1957 T-Bird which is mildly customized with new rear wheel openings matching the front openings, painted in his favorite pale yellow, the color he really wanted to paint his 1941 Ford in as well. 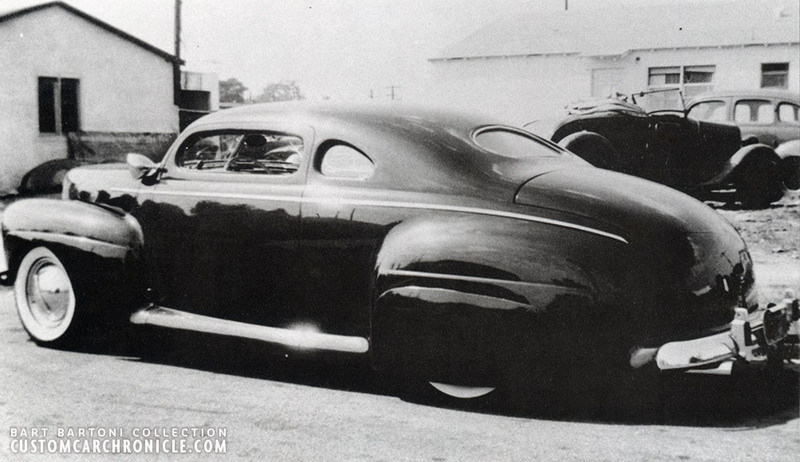 Despite being an early Custom Car, the Jesse Lopez Ford did receive quite a bit of magazine recognition in the early days both Jesse’s as well as Danny’s version. Motor Trend as well as Dan Post featured the car on a full page. Later Dan post used several other photos of the car in newer editions of his Blue Book of Custom Restyling. George Barris also used several photos of the Lopez car (from before and after Jesse owned it) in various How To or Custom Detail articles in the magazines he wrote for. 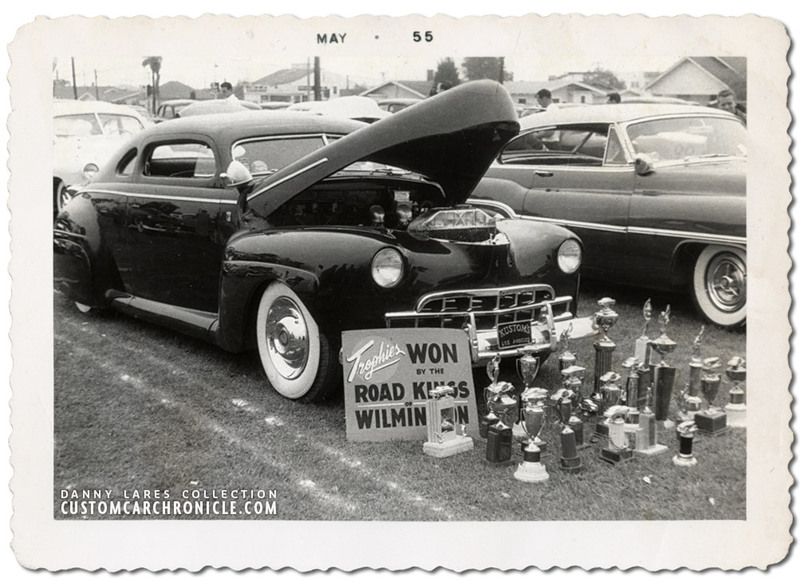 Danny Lares, an active member of the Road Kings-Wilmington car club, bought the Jesse Lopez ’41Ford coupe for $2300.- in 1951. 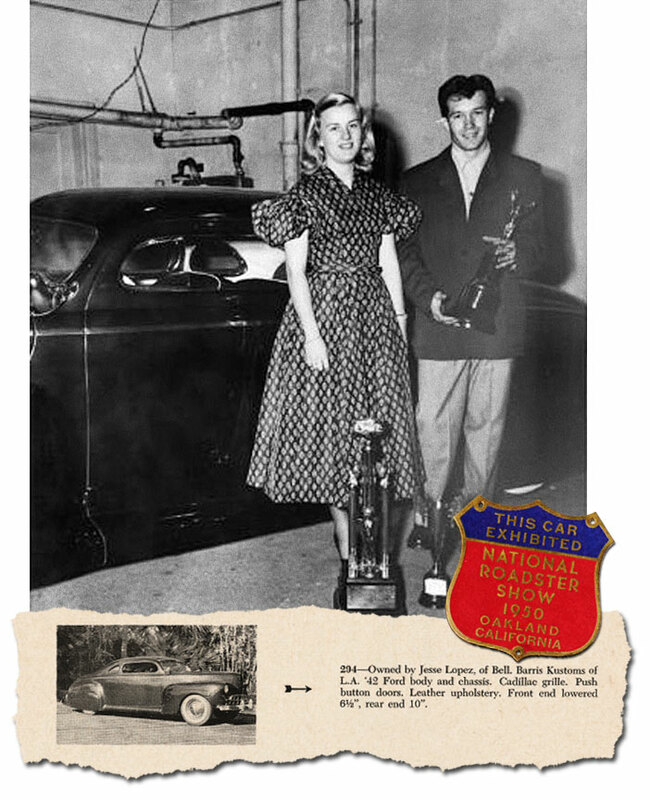 Danny drove and showed the car from 1951 till 1957, winning numerous awards on the Southern California car show circuit. Danny sold the car in ’57 for $500 to a man named Stan Crabtree from San Pedro. Sadly, shortly after buying the car, the third owner of the car, Stan wrapped it around a tree and ended the life of the Jesse Lopez-41 Ford. As far as we know the remains were wrecked, and nothing of the car was saved. 1951 photo at the Barris Shop shows the Jack Stewart ’41 Ford next to Jesse’s Ford. Unique is that the belt line trim is missing for Jesse’s car completely. Possibly the car had just been sold to Danny Lares and it had been freshly repainted? 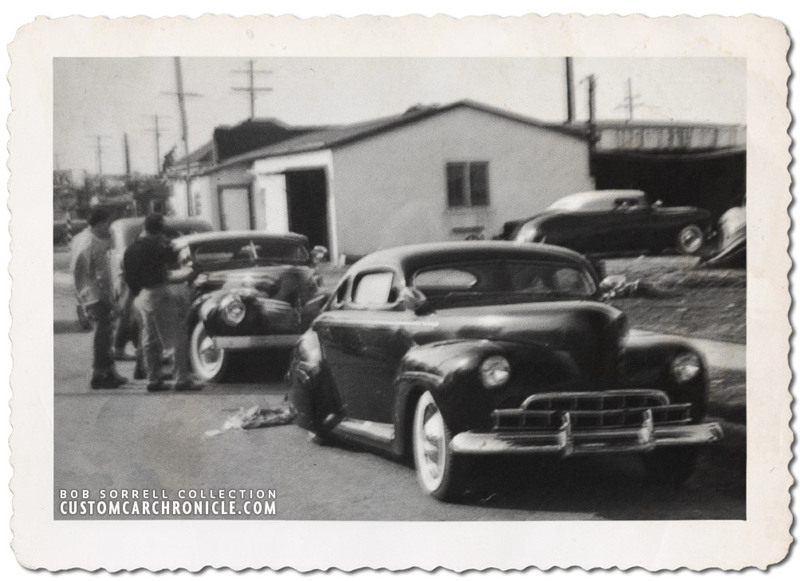 Ultimate Custom Car photo shows the Jesse Lopez ’41 Ford, then owned by Danny Lares (Road Kings plaque) parked next to the Nick Matranga 1940 Mercury. Notice that the Ford is lacking fender skirts and is dressed up with a Cadillac Sombrero hubcap at the rear in this photo. Parked next to Nick Matranga’s ’40 Mercury at another outdoor car show. Danny added the Road Kings plaque on the front and rear of the car. Rear quarter view at an outdoor Car Show shows how fantastic the chopped top and molded (sealed) rear fenders look. The lack of body mounted taillights really help with the smooth look. 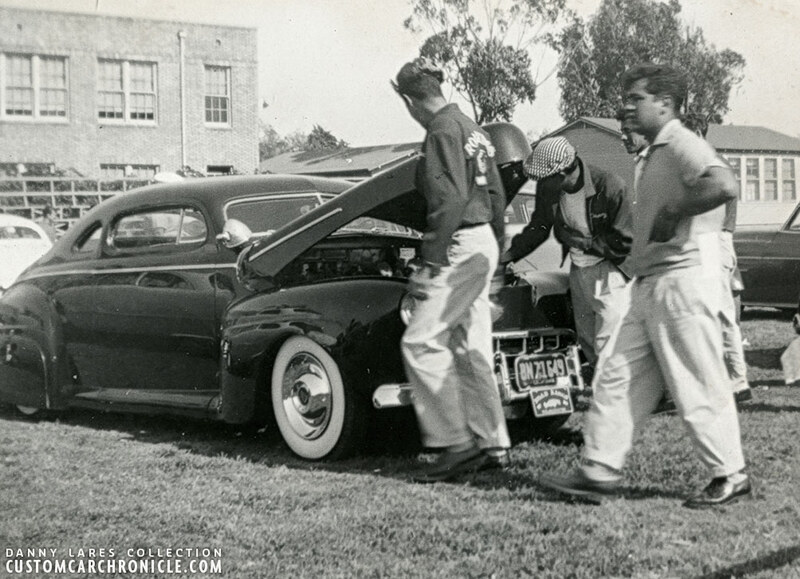 Danny Lares in his Road Kings car club jacket standing against the ’41 Ford was taken around 1952. 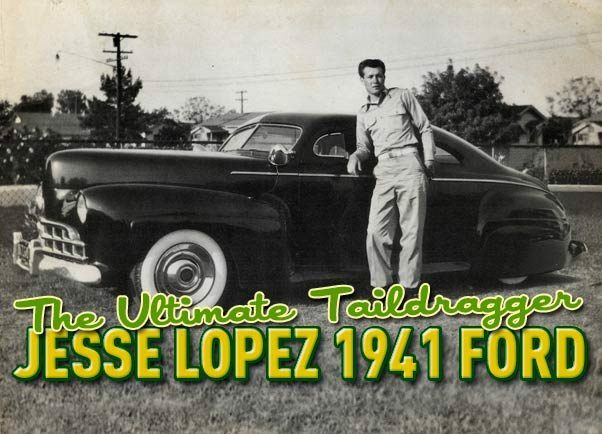 Danny Lares kept the Jesse Lopez ’41 Ford mostly the same during the years he owned the car. There are however a few small changed that were made to the car which always helps us identify the time hen the photos were taken. Especially identifying the car when it was owned by Jesse, or by Danny. The first thing that was changes was the length of the hood side trim. Originally the piece of hood side trim on the car was very short, later a larger section was installed that ran almost to the center of the wheel opening. And some time later a Barris Crest was added to both sides of the car on the cowl. It is really amazing that in a time, the mid 1950’s, when it was so common to make new changes to your Custom Car every few month to gain points at the car show, Danny decided to leave the Jesse Lopez Ford design for what it was. Not make any changes but the few mentioned before. The design was perfect, and fortunately Danny realized that, its what he loved about the car. Looks like Danny Lares is getting ready to race the ’41 Ford. That is Danny behind the car. Notice the numbers painted on the rear quarter window. Photo taken at the Los Angeles Hamilton High School car show. Year unknown, but photos from this event appeared in the December 1954 issue of R&C magazine. That is Danny with the checkered hat cleaning the engine bay. 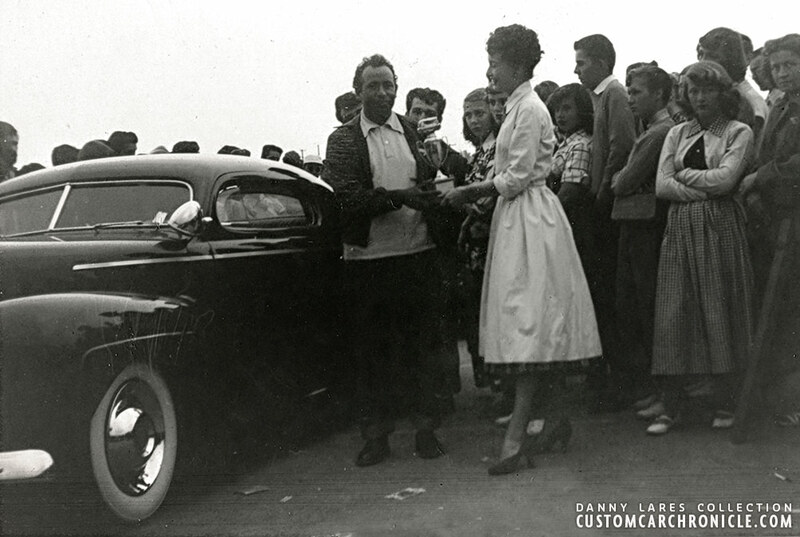 Danny receiving another trophy for the ’41 at an unknown car show. One thing that has always wondered me is that the car has no rounded trunk corners. The flow of the door line, door windows and rear quarter windows is so right on this car. Jesse and Sam might have spend a lot of time on it, but it all has been worth it. Low angle side profile photo with the newly added Barris crested to the cowl. This photo shows that the car might be even lower now than when Jesse owned it. Possibly when the Barris Crest were added to the car a “deal” was made that the car also would have the Kustoms Los Angeles plaque added again. George Barris was a businessman and wanted to promote the Barris Shop and Kustoms Los Angeles club as much as possible. Thrifty drug store parking lot car show photo from 1954. This photo shows how the chopped rear window fits just right and has the perfect size for the chopped top. Unknown outdoor Car Show in 1955. This is one of the very few photos showing a bit of the engine on the ’41 Ford. Notice how many award Danny Lares had won with the car. at least 7 years after it was first created the car still was a head turner. Close up of the photo shows the two carburetors. 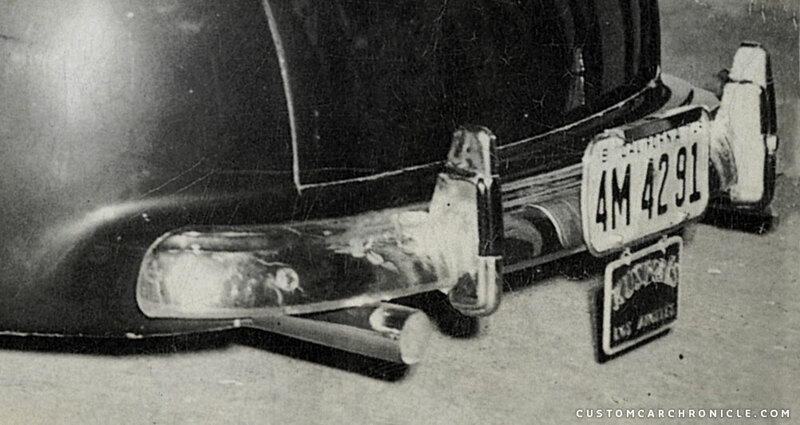 It also shows the slightly recessed headlights, and beautifully molded metal around the ’48 Cadillac grille. Beautiful model posing with the ’41 showing of some more trophies. Notice the perfect flow of all the panels with sharp reflections. Close up gives us a good look at the custom ’41 Ford front fenders with the extra lip Jesse designed. The ’41 Ford at another parking lot photo. This time the show was held in early 1956. Parked next to Danny is the famous ’49 Mercury created by the Ayala’s for Louis Bettancourt and later redone by Barris for Johnny Zupan. 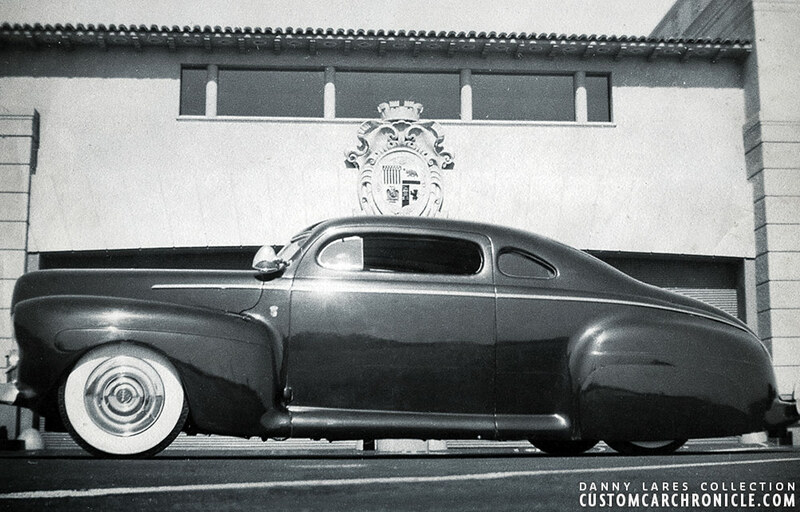 Next to that is the Barris Kustoms restyled ’41 Ford for Frank Monteleon. This nice lower angle photo taken at Bacon Ford shows the extra air intake Jesse added to the car really well. Also take a look at the super sharp reflections in the glossy paint. Closer look at the refrigerator drip pan air intake under the front bumper. Also good visable in this photo are the slightly recessed headlights. Small changes over the years that help identify who owned the car and about when the photos were taken. A) Short hood side trim and single bar flipper hubcaps, pre 1949. Owned by Jesse Lopez. B) Short hood trim, Cadillac Sombrero’s, Pre around 1951. Mostly owned by Jesse Lopez. C) Addition of the longer hood trim Post 1951. Owned by Danny Lares. D) Addition of the Barris crest to the cowl, around 1953. Owned by Danny Lares. These two photos show perhaps the best what Jesse Lopez meant with a top shaped after the Carson Padded tops he liked so much. Uniquely shaped, and the lines on this car are still considered to be as perfect as they can be. 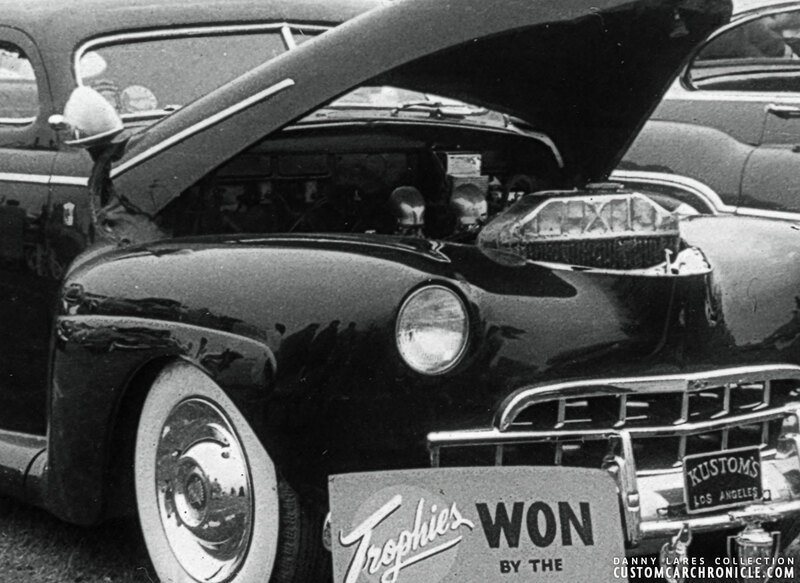 The Jesse Lopez 1941 Ford has been a trend setter from the moment it was finished. 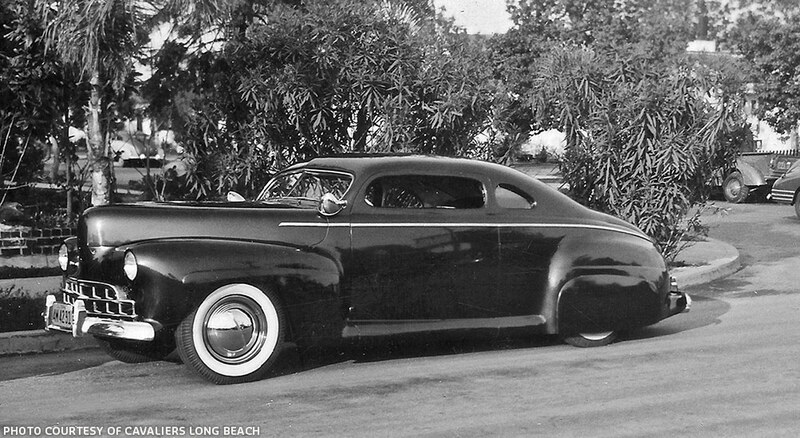 Jesse and Sam Barris had created the ultimate ’41 Ford coupe using the much harder to chop (according to Sam Barris) long door coupe. 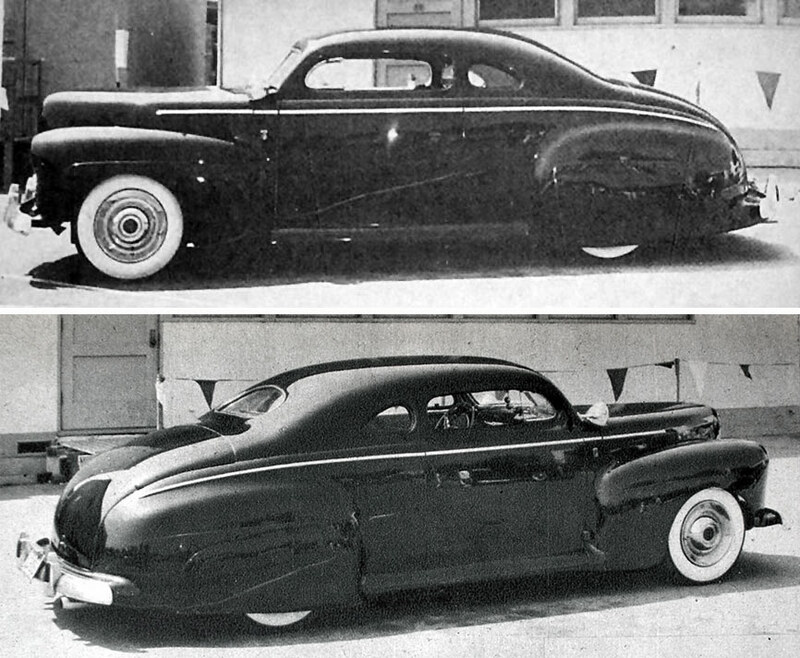 The longer doors and side windows created that the chopped coupe looked a mile long, especially with the new roof shaped designed by Jesse based on what he liked from watching chopped padded top convertibles. The combination of the heavy chop with the speed boat stance, heavy lowering of the frame, created an almost cartoonish effect perfectly balanced. The car was an instant hit when Jesse started cruising the streets of Los Angeles. 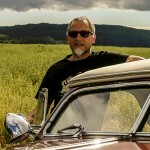 Many photos of the car have appeared in numerous publications of the years and have since then inspired many builders around the globe to create taildragging Customs. 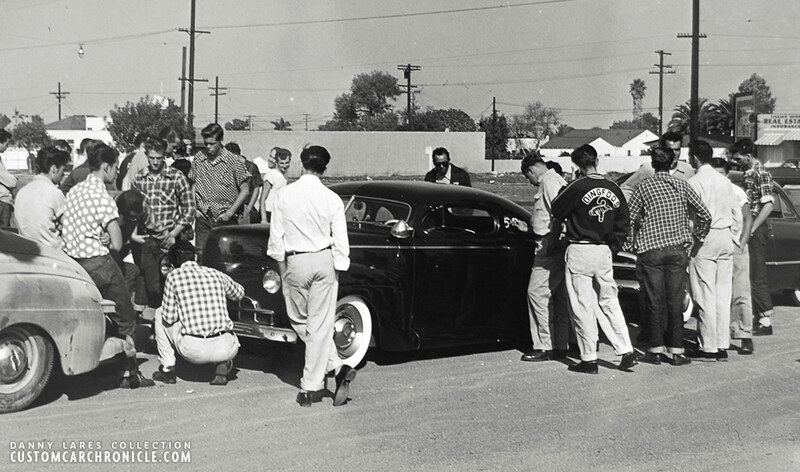 Danny Lares later ran the Lions drag strip track, worked at LADS (Lions Associated Drag Strip) timing association from 1955-65 as tech timer and official starter flagman, and was a founding member of Road Kings Car Club Long Beach. He passed away in 2003. Danny Lares’s nephew George Lares is now the care taker of the Danny Lares Collection. Jesse Lopez, David E. Zivot, Michelle M. Yiatras, Trace Edwards, George Lares and Jerry Daman. One of the best for sure Rik. Anybody hear anything about Jive’n Jers replica ? I know he finished it and there was supposed to be some big deal Mag article about it. But it seems to have dropped off the the map. I wonder if the replica car and Mr Lopez ever got together ? Rik…You have covered the details and essence of this foundational custom in fine form. Where Michelle had sought to narrate the man and his times as well as the expression of it as exemplified in the ’41 Ford, you rightly point out the seminal nature of this particular car and the difficulties inherent in the restyling efforts involved. Jesse did purchase a brand new (one of the 1st delivered to Calif.) 1958 Ford Thunderbird which immediately upon driving it off the lot headed over to the Barris shop to paint it in his own formulation of translucent “Candy Red” that George liked so much he immediately bought the confidential mix. The custom-restyling world owes quite a lot to the tastes, procedures, and talents/workmanship of Mr. Lopez. Well done Mr. Hoving. Great article based on a beautiful custom. Great article! Ha, I never noticed the different hood trim lengths or Barris crests not being on it from the beginning…interesting! In 2008 I was in the BORDERS BOOK STORE in SANTA CRUZE and some guy said he had a barris wreck in his yard……. I was like yeah right and blew the guy off……. Wish I had of taken him more serious…..!! !